Summer may not officially be here yet, but the weather around here isn’t waiting. It was super hot yesterday and I’ve already been wearing my favorite summer outfits. After having a baby, maxi skirts and comfy dresses are at the top of my wardrobe list:) I made this casual summer outfit board on Polyvore recently that totally captures my summer style. Cute, comfy sandals, a bag that reminds me of vacation and a summery pop of color. It screams summertime to me! To get ready for all those cute clothes, I was recently sent some beauty products to try that are perfect for summer. Being a new momma, being able to take a few minutes to pamper myself only happens on a rare occasion so it was nice to sit down and take some time for myself and sample these products. What’s part of your summer beauty routine? Do you also live in comfy dresses and skirts? 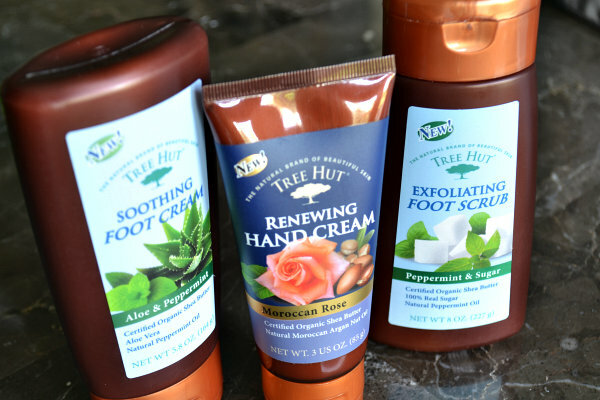 You can get Tree Hut products ar WalMart and if you want to see more from Tree Hut, head over and like Tree Hut on Facebook and follow Tree Hut on Twitter! « Mombo Nursing Pillow Giveaway!